Backup mobiles to cloud, access data on the go! 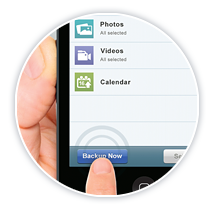 Backup your phone contacts, calendar events, photos, videos, call logs, and SMS with a single touch. You can restore data backed up from any mobile device or computer, with just a single tap. Read documents, view photos and videos, and playback music backed up from any device. You can copy, move, rename, and delete files backed up from any device using your mobile. 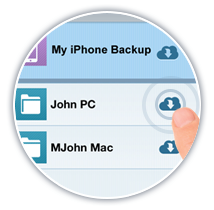 Share your IBackup account data, with anyone you wish, over email, Facebook, Twitter and more. Backup all the existing photos, videos, and any new captures in real-time to your IBackup account. Schedule periodic backups to secure your mobile data. Retrieve up to 10 older versions of all the backed up items, including calendar events and contacts. Create shortcuts to access files quickly, instead of navigating to the individual folders to find them. Note: All feature description on this page may vary on iOS and Android device. Requires iOS 9.0 or greater. Compatible with iPhone, iPod Touch and iPad.